The Austrian Simmental is a locally derived breed that started in the 19th century with the crossing of imported Swiss Simmentals and several old local breeds of Pied Mountain. The Austrian Simmental, once a dual-purpose breed, is slowly becoming more focused for use as either a milk or beef animal. The Austrian Simmental used for milk has been part of a breeding program (together with Bavaria, Germany) that has led to crossing them with Montbéliarde and Red Holstein since 2000. 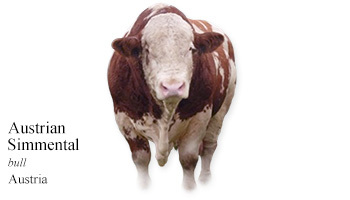 This has been done to improve milk yield and udder conformation and these animals are registered as pure Simmental. A former variety of the Austrian Simmental known as the East Styrian Spotted (Österreichisches Fleckvieh in German) is now extinct. My Daily Cow® Austria and read about other Austrian cattle breeds.